Figure review time! 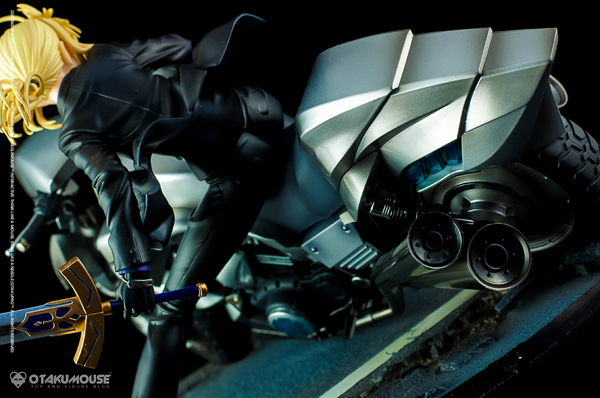 In this review, we are going to take a look at one of my most anticipated figures of 2012. 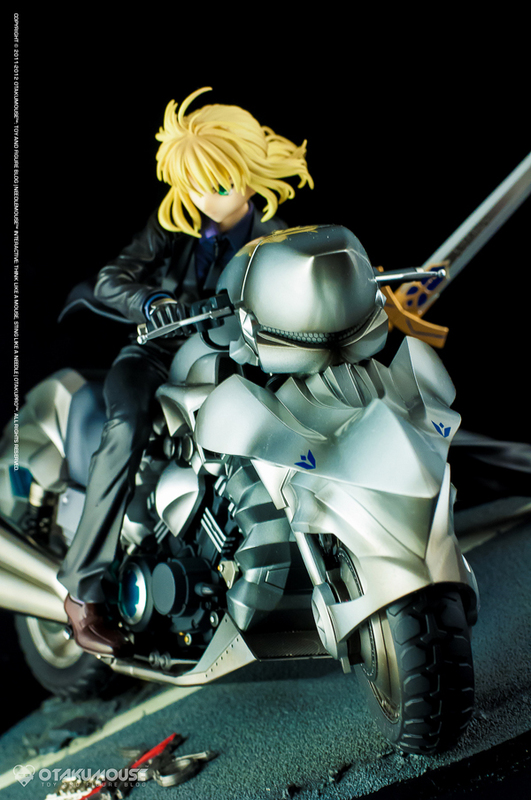 It’s the 1/8th scale figure rendition of Saber and her Motored Cuirassier by Good Smile Company. 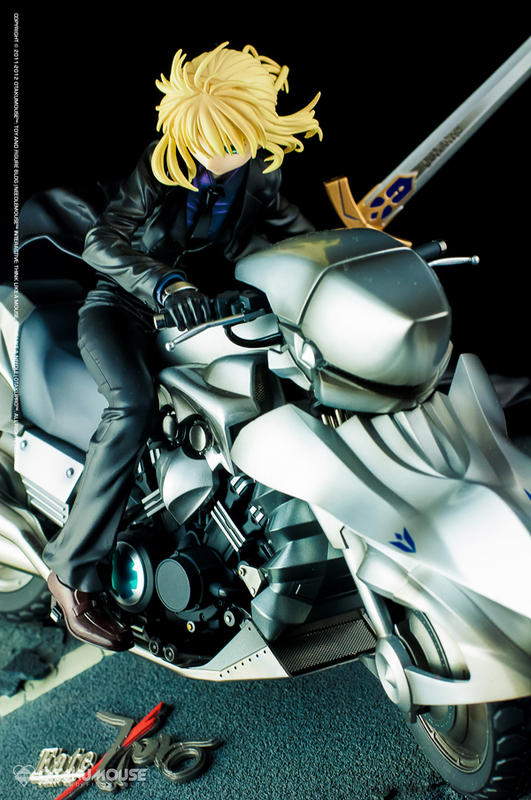 This figure of Saber from the anime Fate/Zero is one of the best figures released this year. The details are just incredible. 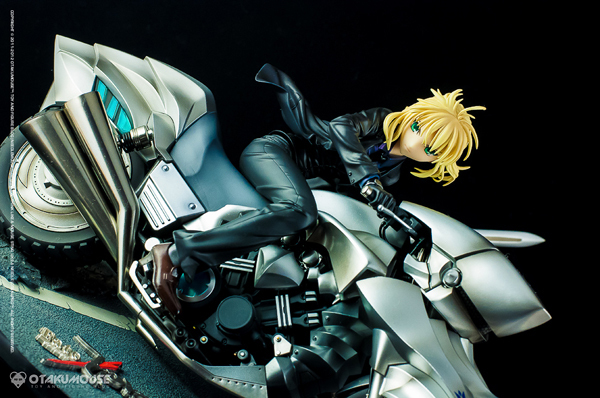 Even though the figure is scaled at 1/8, the figure is still quite huge because of Saber’s detailed bike. 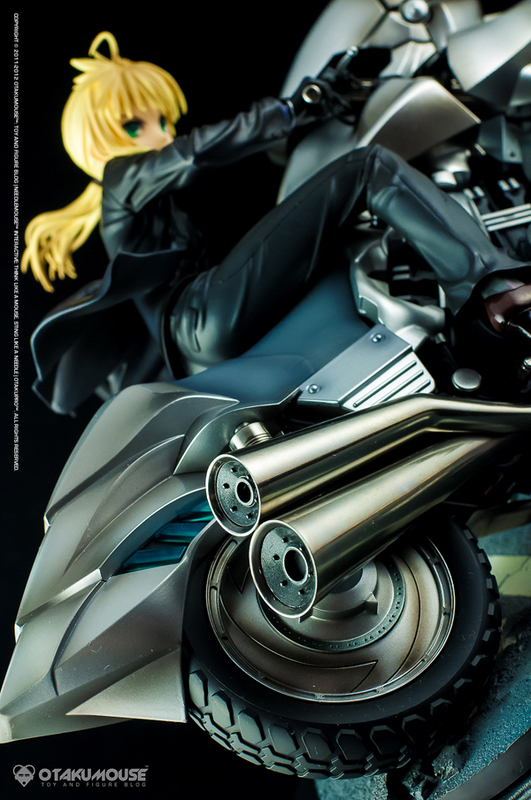 When I first saw the very first unpainted prototype images of this figure at Wonfes, I already told myself that whatever happens, I MUST own this figure. The price of this figure is inside the “premium” range so yeah, It’s a bit pricey. But don’t worry about the price because you will soon forget about it once you own this figure yourself. And I tell you, It’s super worth it! 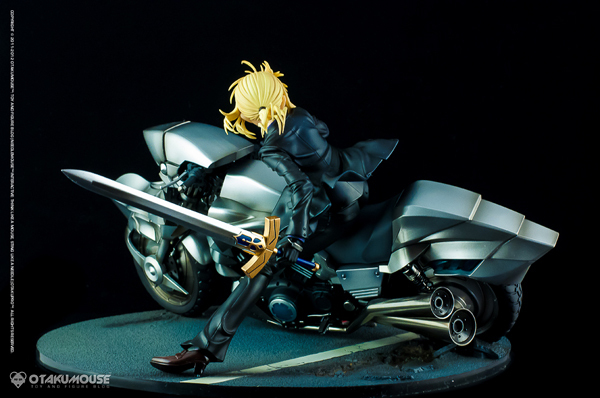 For those who are not familiar with this particular pose, It was actually taken from episode 21 of the Fate/Zero anime series (correct me if I’m wrong here). It is when Saber is having a high speed persuit with Waver Velvet’s guardian, Iskandar. This is actually one of my favorite scenes in the series. Fate/Zero is a fairly new anime so they really utilized the visual fx techs to make the scene flashy and action packed. 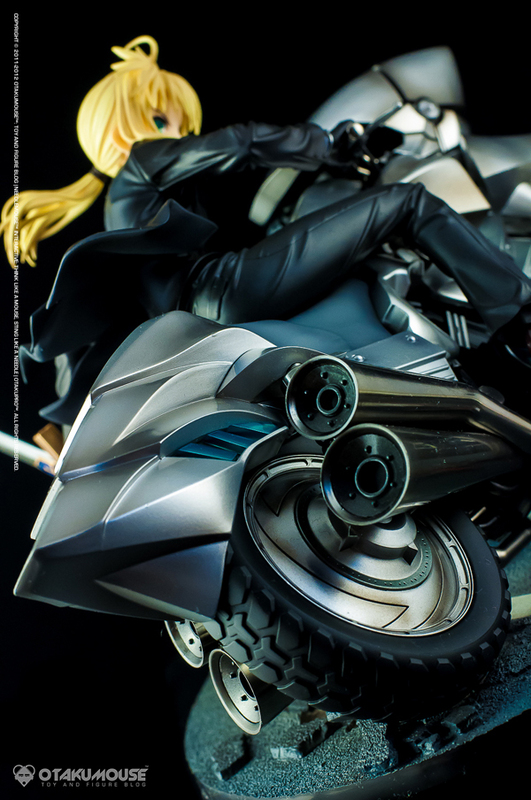 This is the scene where we get a full glimpsed of Saber’s Motored Cuirassier. 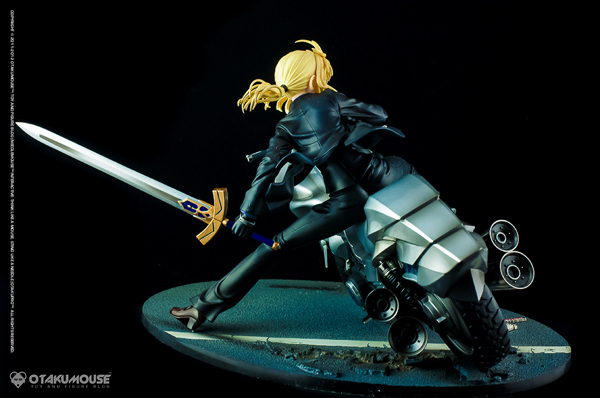 Good Smile Company did an awesome job in transforming Saber’s iconic pose from that scene into a fully realized detailed figure. Like what they’re always saying in the design industry, It’s “pixel perfect”! Every detail was sculpted and recreated perfectly. 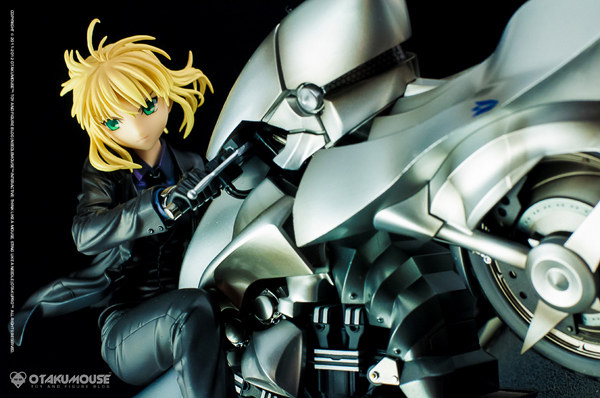 From Saber’s focused look up to the internal components of her bike. This is indeed a magnificent figure that is a worth it addition in your entire collection. Enough chit chat and let’s take a look at this incredible figure! 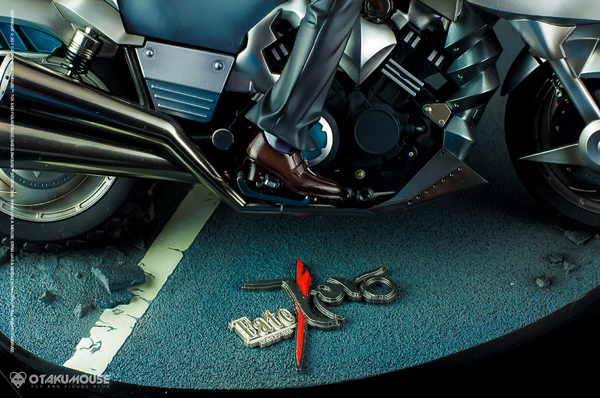 The figure is scaled at 1/8, though the super detailed bike makes it a huge figure compared to the standard 1/8th scale figure out there. When I first got the figure, It took me a bit of time to attach everything in the base. I was really careful in assembling the figure because I’m worried I might break something in the process. I realized it’s not hard at all. The figure comes with a total of 6 separate parts. 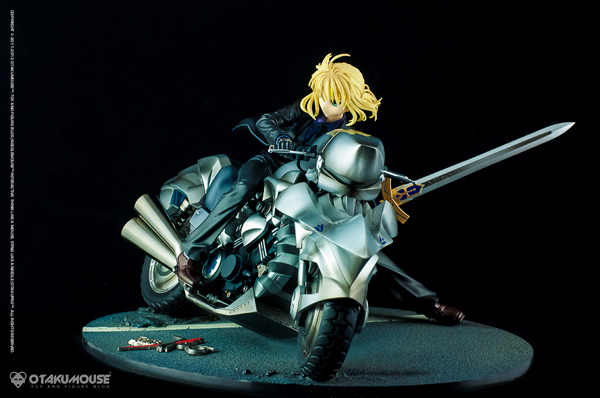 The base, the 2 bike parts where one of Saber’s feet is placed, the actual Saber figure, and Saber’s Excalibur sword. 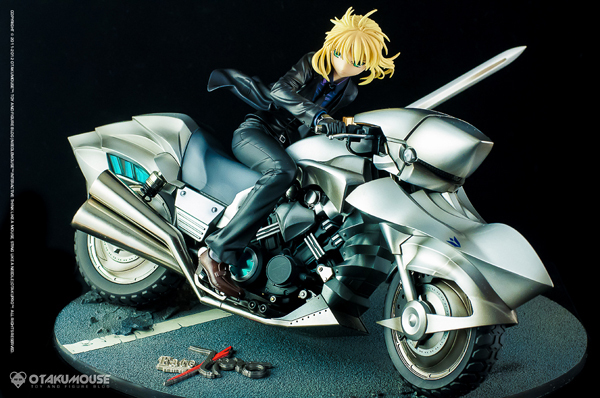 There are 2 pegs placed on the base where the motorcycle’s front wheel and Saber’s left foot is attached. The figure is stable once everything is setup. The figure also feels solid and durable when you hold it. 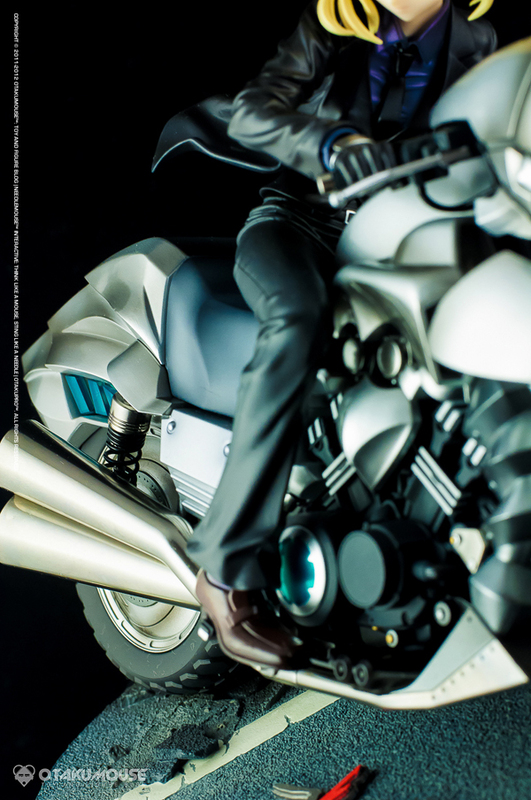 The figure is also a bit heavy due to the complexity of the bike. 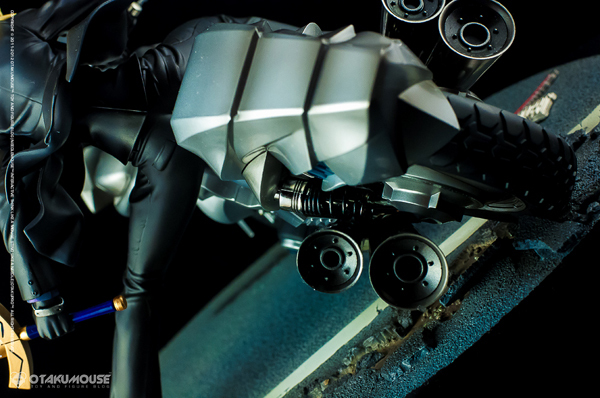 Her signature black suit outfit was recreated with outstanding detail. 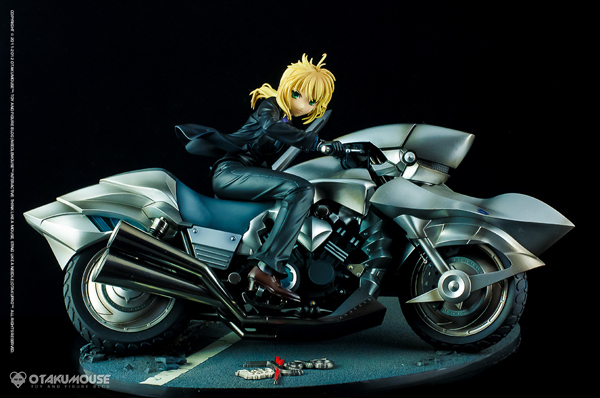 Another highlight of this figure is Saber’s amazingly detailed bike. 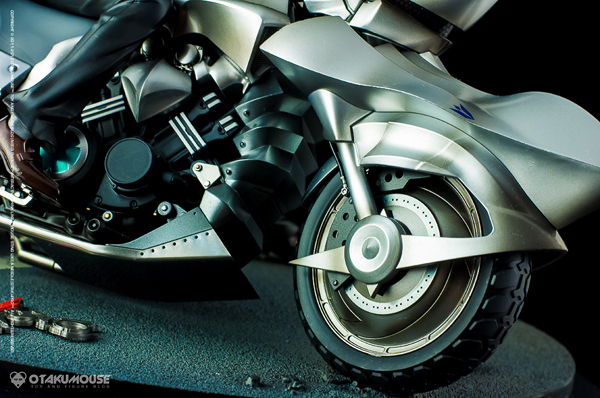 Every single mechanical component was sculpted with tremendous accuracy. 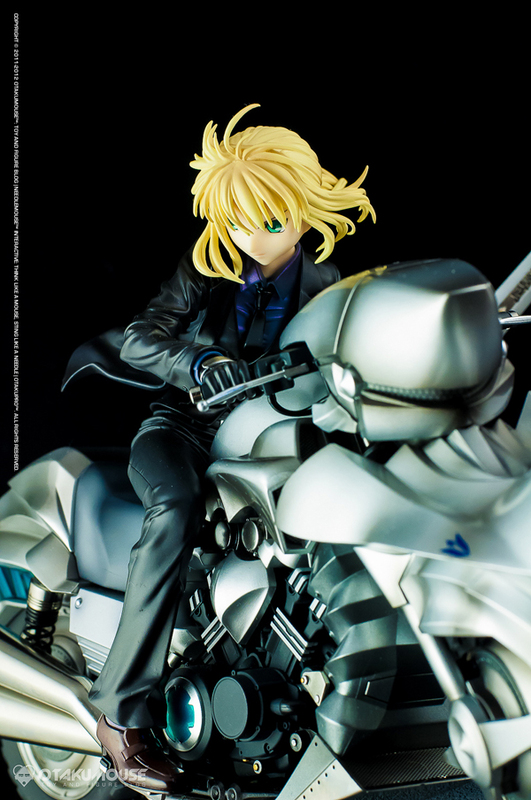 Saber’s bike alone is one reason why you should get this figure. 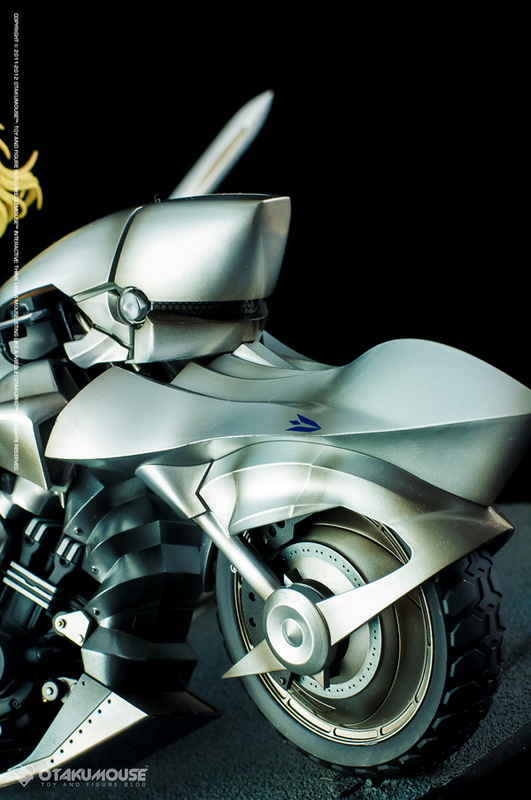 The technicality of the bike’s overall sculpt is just amazing. 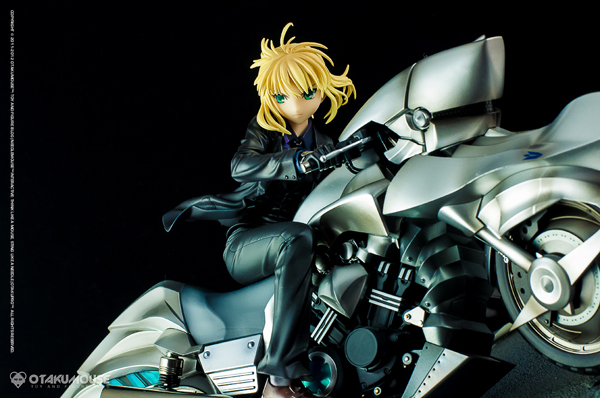 The bike fits Saber perfectly. Placing her on the bike is just a matter of inserting her right hand on the handle bars and just positioning her on top of the bike. Her left leg works as a support for the entire figure. A peg hole is present on her left shoe which is attached to the base for added stability. 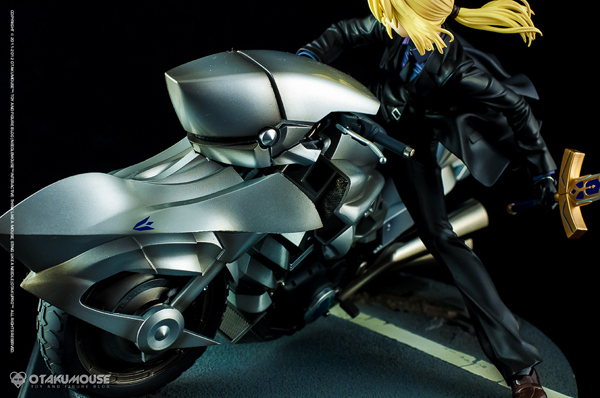 One of the things that caught my attention when I first saw Saber’s bike was the super detailed wheels. I thought that the tires were made out of real rubber. Unfortunately, It’s not. It’s still part of the overall PVC assembly. 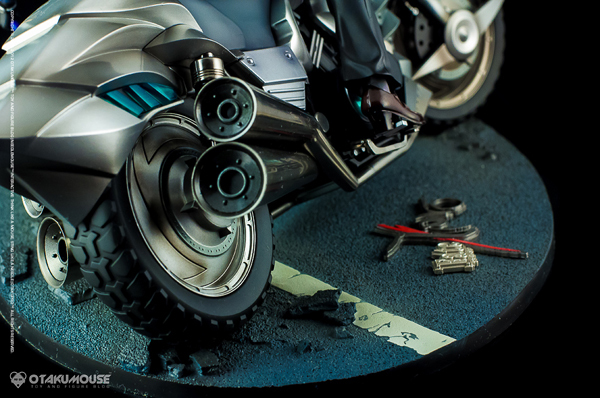 If the bike is not attached to the base, the bike’s front part can be articulated. You can basically rotate it at roughly 100º . This articulation is also needed because you’ll have to position the front wheel to match the “road crack” that is present on the base. Once the bike is attached to the base, you can’t rotate that part anymore. 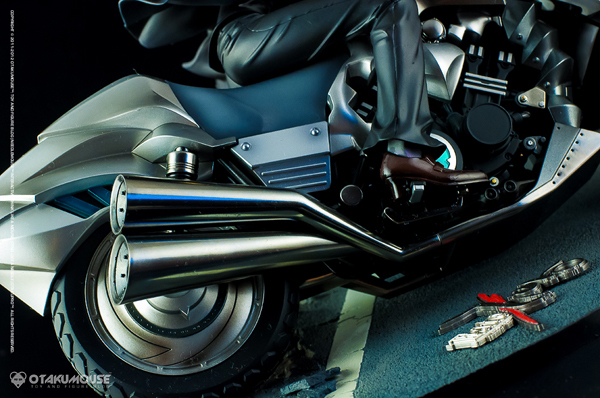 Real springs are also used on the bike’s suspension system. 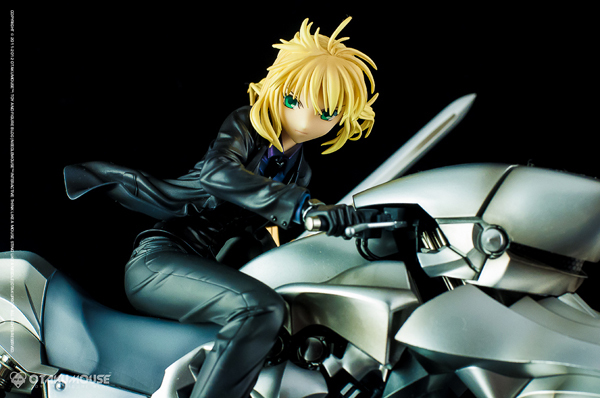 Really love the somewhat cool and focused look of Saber in this figure. The overall paint job was also top notch. Paint job made the bike look like it’s made out of metal. This is one of the best figures released by GSC to date. Everything is very well detailed. Have you watched the anime? Honestly, that anime is kinda sad and tragic at the same time. You won’t take sides because there’s no such thing as good or bad guys in the entire series. It’s just plain conflict with the rest of the characters and their own personal agendas in life. I also thought at first that the wheels are articulated because it looks like it is. Sadly, the wheels are static and is a part of the whole bike assembly. You will have to pay a premium price for this figure. But don’t worry, all of that spent $$$ are worth it! 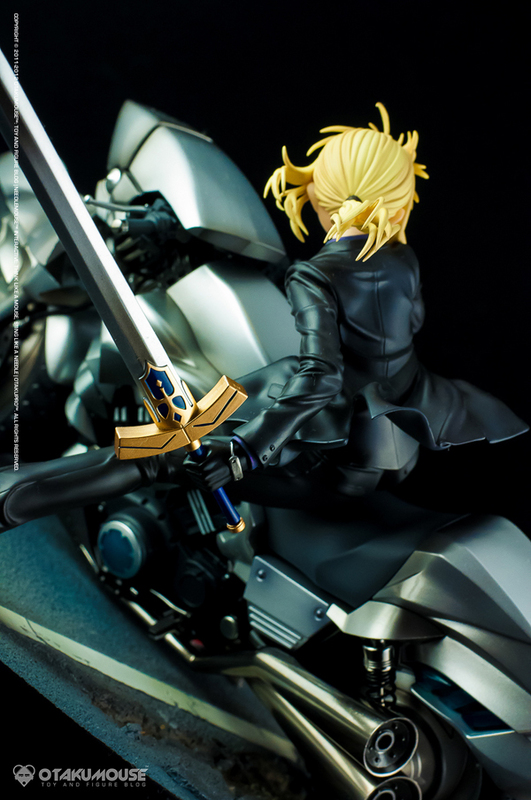 Saber is carrying her signature sword in this particular pose. The mighty Excalibur. It is her “noble phantasm” in the anime series. Its type is considered as an “anti-fortress” because of its destructive power. Honestly, Saber is a bit overpowered once she uses the Excalibur. 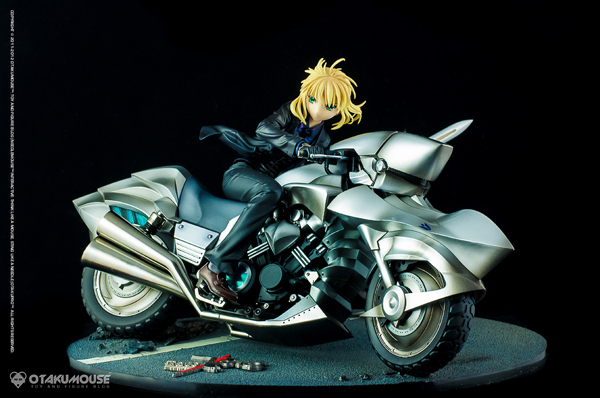 Since Saber is somewhat doing a power slide with her bike in this particular pose, road cracks and debris are also present on the base. GSC’s attention to detail is simply amazing. Negative parts of the figure? Honestly, I can’t seem to find one. In my entire collection, this figure is now my new favorite. 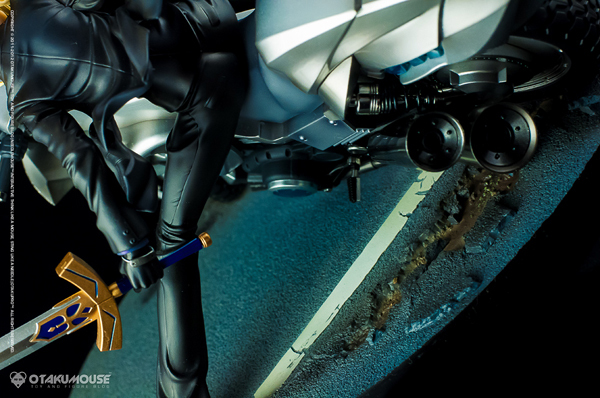 The dynamic pose and the incredibly detailed parts makes it a real attention grabber in your collection. 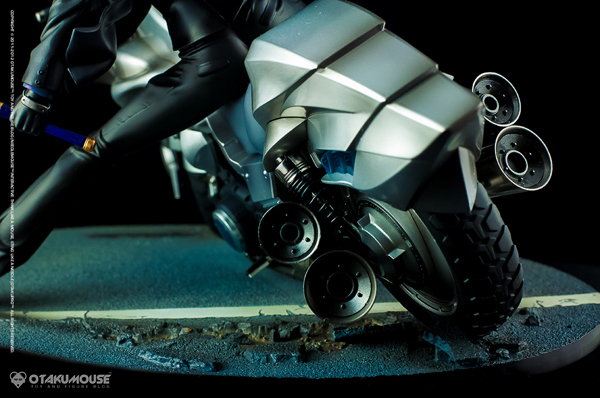 The base was sculpted and textured based on the road scene in episode 21. 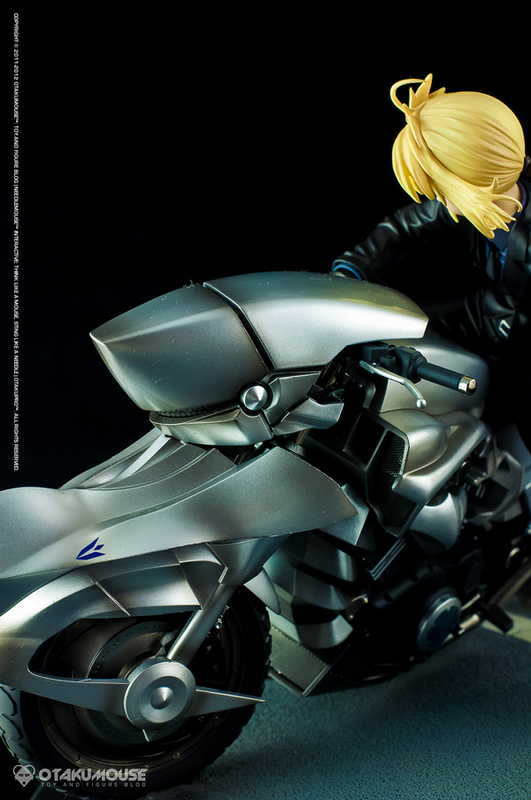 A very nice rendition of the anime’s logo is also attached on the base. Some final shots to wrap up this figure review. This figure is by far the most technical figure I’ve ever seen. 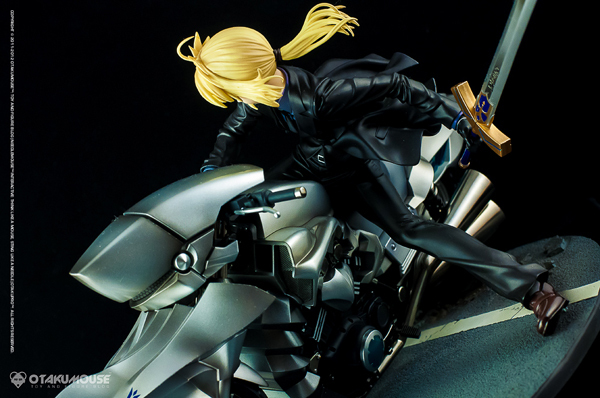 The overall sculpt and crazy details makes it a MUST buy for any Saber fans out there. 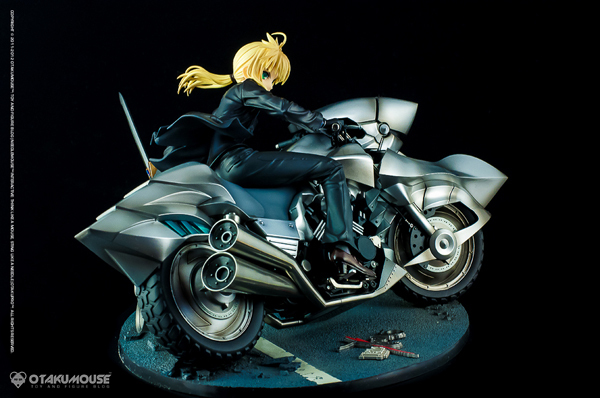 The selling point of this particular figure obviously was Saber’s super detailed bike. 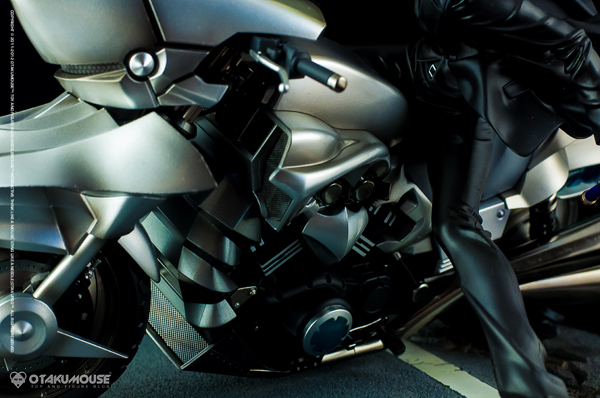 The bike is a figure on its own. 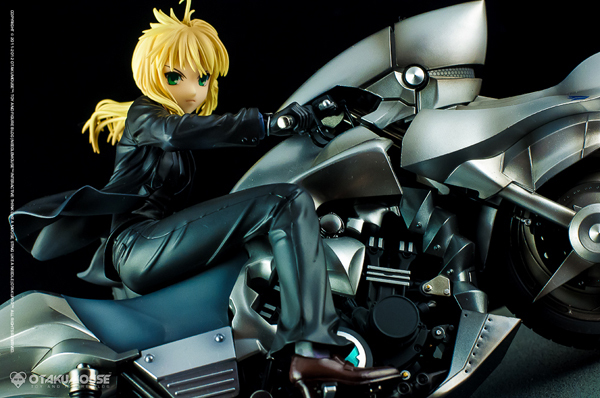 Saber was also rendered perfectly accentuating her cool, focused, and badass personality. 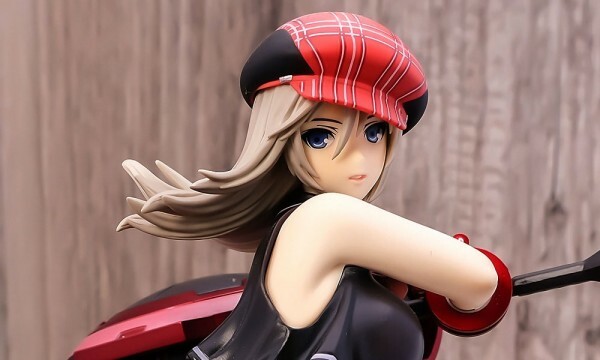 Her iconic power slide pose is very nice to look at both in the anime and on the figure itself. Technically, I can’t seem to find any negative aspects of this figure though I think if there’s any negative points, that would be the price. She’s a bit pricey for her scale. But like what I’ve been always saying in this review, you will soon forget the price tag once you own her. She’s an incredible figure! I didn’t expected the front to be moveable and also that there was a real spring at the back. 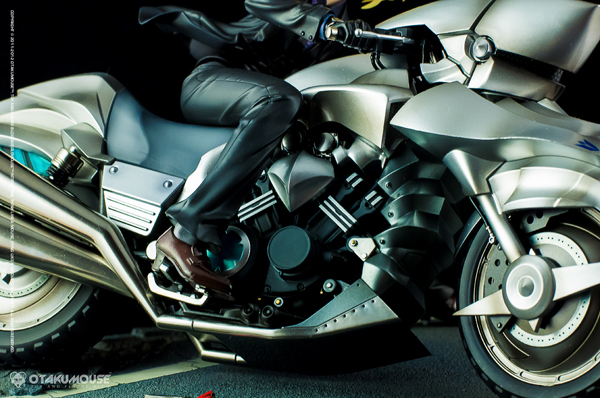 The purple shirt under her suit adds a nice color accent, as well as the transparent blue parts on the bike. 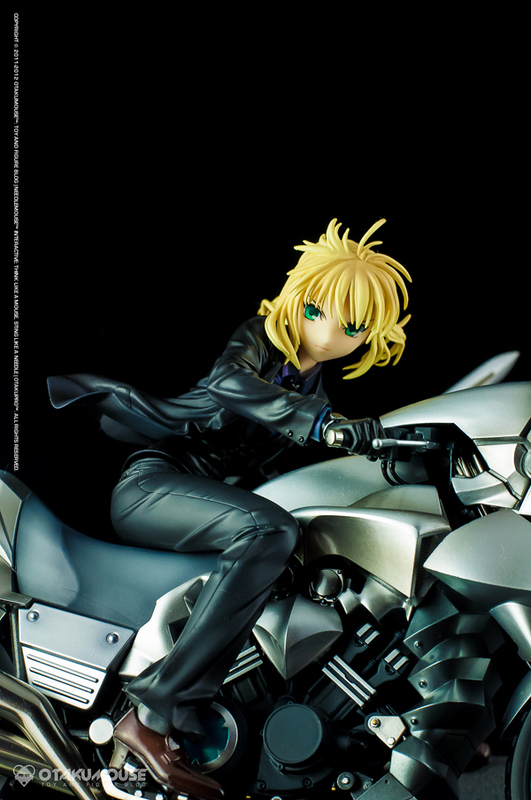 @Wieselhead: Yeah, the main selling point of this figure is Saber’s bike. 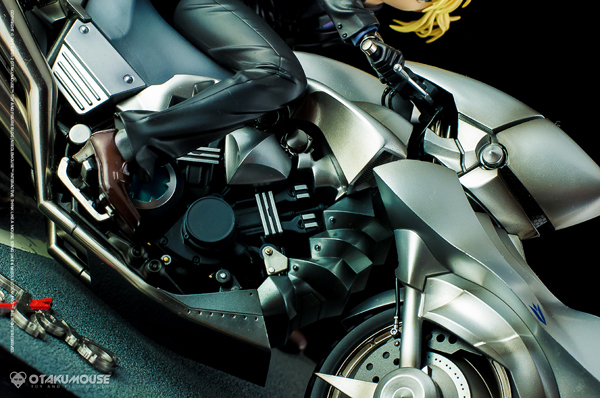 The details of her bike is freaking crazy. Super detailed! 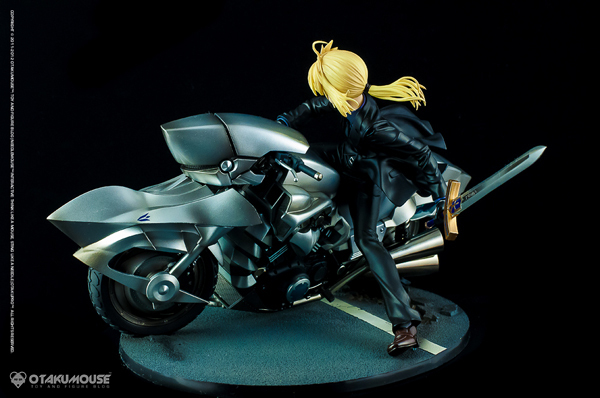 Between Saber Motored Cuirassier or triumphant excalibur, which one you choose? sharp review bro! i had my favorites in the anime, but i tried not to get too attached since the ending’s fairly obvious. but tragedy aside, this is easily one of the best figures this year! must have! @bumrush1223: Thanks so much buddy! Yeah, I think that was my mistake when I watched the Fate Zero series. I got too attached with the characters and it broke my heart when I reached the ending hahahahaha! And I definitely agree. Like what I’ve said, if there is a figure awarding body in Japan, this is obviously one of the candidates for “Best Figure of the Year”.